Manafort-Precision Completes Cast-in-Place Concrete Contract for University of Massachusetts Boston - Manafort Brothers Inc.
Manafort-Precision recently completed a 10,250cy cast-in-place concrete contract for University of Massachusetts Boston’s fast-tracked, 260,000-square-foot public–private residence hall project. The project, led by Shawmut Design and Construction, consisted of two buildings, one seven and one twelve stories. The overall project was completed in just 20 months and forms the new northern gateway to campus as part of the university’s 25-year Campus Master Plan. 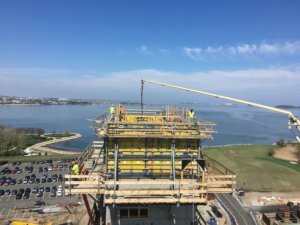 Manafort-Precision’s scope consisted of casting the foundations, 260,000sf of slabs, 5 concrete elevator cores and all of the architectural site concrete and sidewalks. Manafort-Precision is proud to have been part of the team on this impressive project!